Business economists are skeptical that the Federal Reserve’s benchmark interest rate will top 1% by the end of next year as central bank officials project. The poll of 46 professional forecasters by the National Association for Business Economics pegged the federal-funds rate target at 0.845% at the end of 2015. That reading is well below the median 1.25-to-1.50% range Fed officials themselves projected for the end of next year in forecasts released earlier this month. The Fed funds rate has been pegged near zero since the end of 2008. To top 1% in the next 15 months, the Fed would need to act fairly aggressively after the central bank moves to raise rates. Outside economists appear to betting on the central bank taking a more cautions path. Last week, New York Fed President William Dudley said “I think people shouldn’t overweight the value of those dots” that indicate interest-rate forecasts. He echoed similar statements made earlier by Fed Chairwoman Janet Yellen. The difference between the economists and the Fed’s rate forecast comes despite very similar economic outlooks. The economists surveyed project U.S. gross domestic product will advance 2.9% during 2015 and project the unemployment rate to fall to 5.6% by the end of next year, from last month’s 6.1%. The Fed projections, released Sept. 17, forecast the economy will grow between 2.6% and 3.0% next year and see the unemployment rate in the 5.4%-to-5.6% range at the end of 2015. Of the economists polled by NABE, 43% expect the first increase in rates to occur in the second quarter of next year and 26% say the first increase will occur in the third quarter. 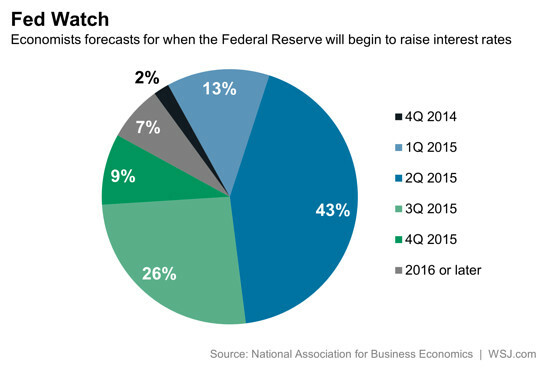 The majority of Fed officials expect the first move on interest rates will not come until next year. The Fed’s forecast does not name a specific quarter for the move. Following their policy meeting this month, Fed officials continued to say they plan to wait a “considerable time” before acting to raise rates. The economists surveyed also pointed to a growing threat to the U.S. economy from the Ukraine–Russia conflict. Of those polled, 47% said the “fallout from the crisis” will hinder domestic growth. That’s up from 34% with that view in a June survey. The reading could indicate that any businesses “exporting to Europe are likely to feel the effects,” Mr. Silvia said. Almost all of the economists surveyed–98%–say the European recovery will be hindered by the conflict. That’s up from 84% in June. ← August New Home Sales Surge — Highest in 6 Years!